Becoming a firefighter is a rewarding career choice to embark upon for any individual. Employment with the City of Semmes Fire and Rescue Department is a challenging opportunity and we are looking for professional minded individuals who are looking to serve the residents in the Semmes community by providing fire and safety services. The Semmes/Fire Rescue Department is one of the busiest Fire and EMS services in Mobile County. The department covers 55 square miles and operates 3 BLS Engine Companies, Ladder Truck, and other specialized apparatus. 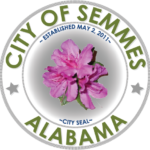 With an average of over 3,000 calls per year, Semmes is a rapidly growing community. SFRD field personnel work a 24-hour shift and 48 hours off for full time employment. we also employ part time members that work a 24 hour shift as needed. Applications are available on the City of Semmes website under the Human Resources Department. The completed application and a resume must be submitted in person at Semmes City Hall, 7875 Moffett Road Semmes, Alabama 36575 between the hours of 9:00 a.m. and 5:00 p.m.. Questions regarding any firefighter job postings can be directed to 251-649-8811. Available positions will be posted on the website as positions become available. Qualified applicants will be called to participate in a structured interview.